Hello, friends...Happy Friday! 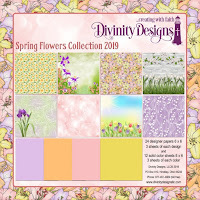 It's time again for the new Divinity Designs Release. 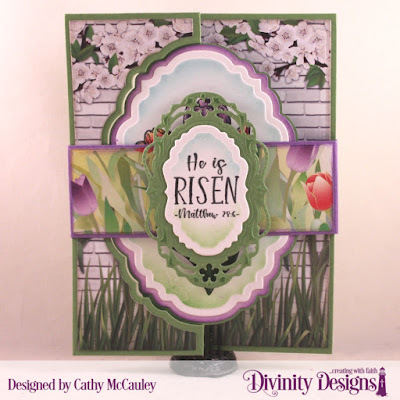 The beautiful florals, scripture, stencils, dies and papers being released this month are perfect for creating springtime and Easter projects. My first sample was made with the new John 3:16 Single Stamp. 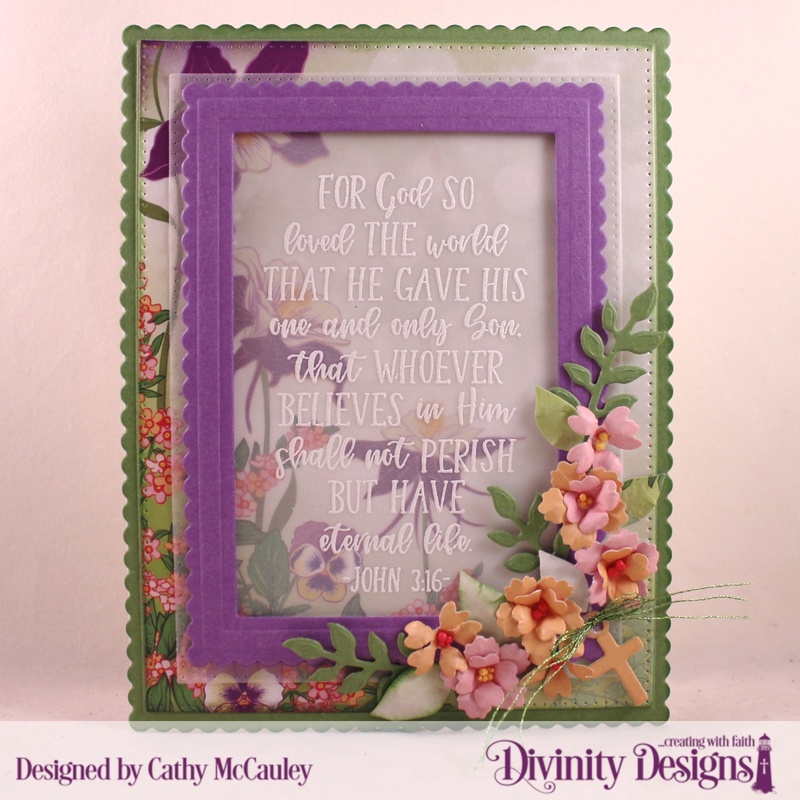 Creative Nugget: The John 3:16 verse was white embossed on vellum. 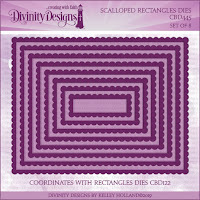 A frame was cut with the new Scalloped Rectangle Die and a Pierced Rectangle Die. 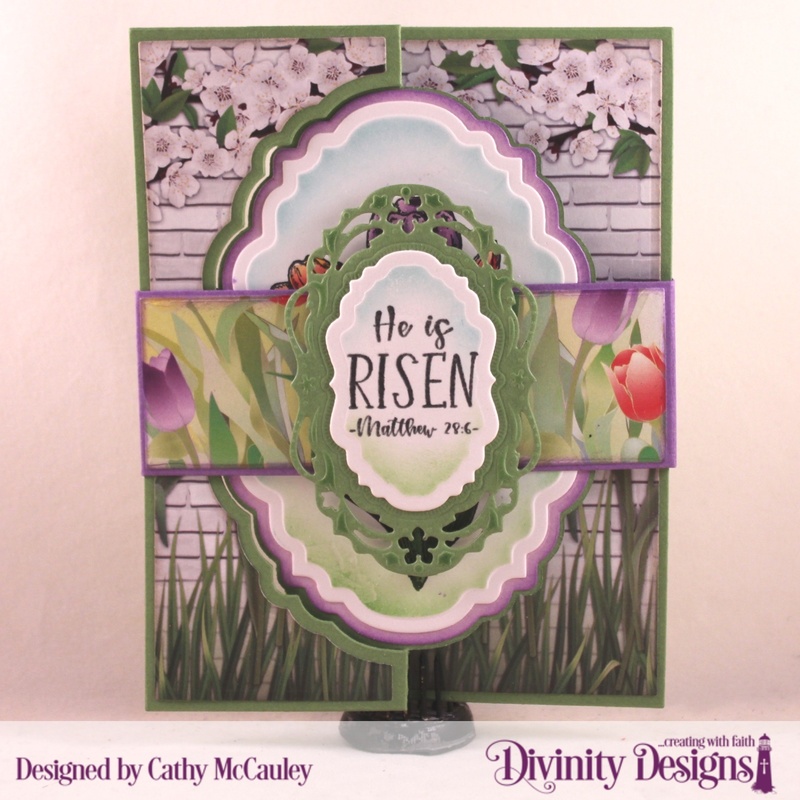 The verse was layered onto paper from the Spring Flowers Collection cut with a Pierced Rectangle Die and then to card stock cut with the largest Scalloped Rectangle Die. The flowers, leaves and cross charm were cut with dies from the Festive Favors Die Set, shaped and attached to the corner of the card. 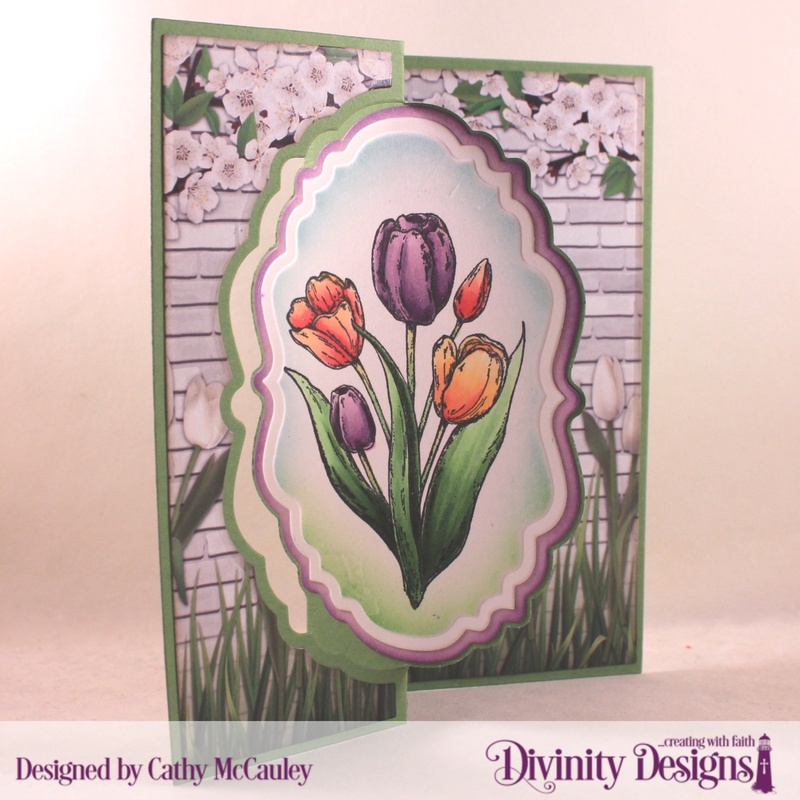 Prills were added to the centers of the flowers to finish the card. 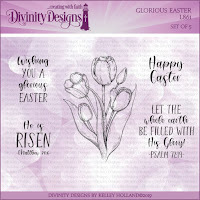 My second sample was made with the new Glorious Easter stamp set. Creative Nugget: The Vintage Label Flip Card With Layers Dies were used to cut the card base and the layers from papers from the new Spring Flowers Collection 2019. The belly band keeps the card closed and was cut with the Belly Band Dies. The sentiment from the Glorious Easter set was stamped on a panel cut with one of the Vintage Label Dies and mounted to a frame cut with a Vintage Borders Die. The Copic colored tulips can be seen when the belly band is removed. Another sentiment was stamped on the flip side of the vintage label. 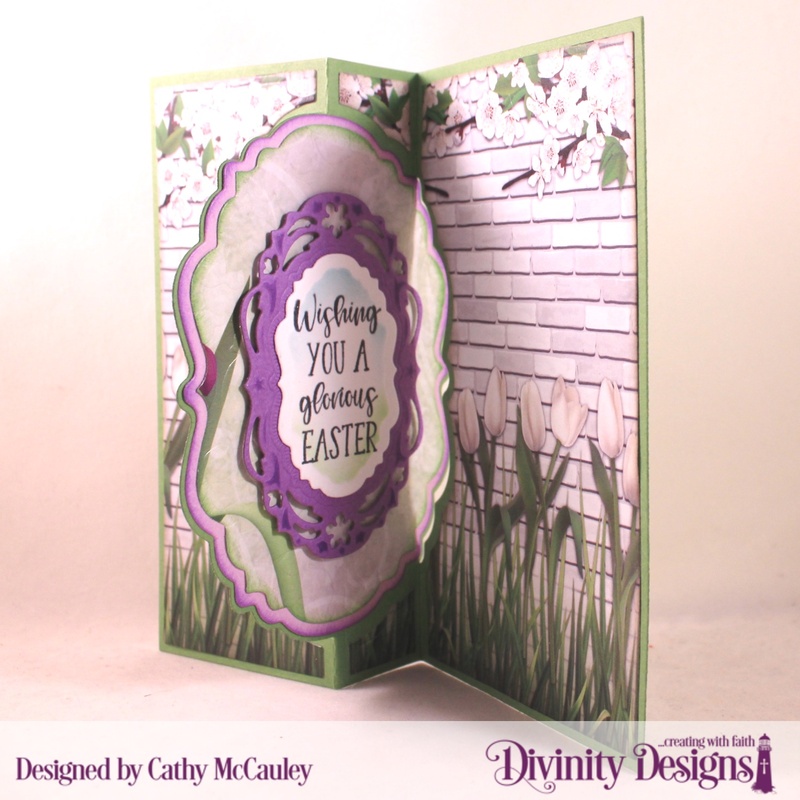 It is difficult to see on the photo but the layer cut from paper from the Spring Flowers Collection 2019 was embossed with the Flourishes Stencil for some added texture. Thanks so much for stopping by...Be sure to pop on over to the Divinity Designs Blog to check out all of the beautiful projects creative by the Divinity Divas using the new February release. Both your cards are gorgeous! I love the sentiments, the colors and the details in your designs. Thank you so much for sharing them with us at PIP Challenges!